I am so happy about how my efforts to get a head start on cooking for the month have gone over the last few days. I am still way behind in the learning stages when it comes to domesticity, and I have never undertaken a project quite like this. Given my past experiences, I have to admit that I was a little bit afraid of trying out so many new things all at once. I really don't think there are any of the recipes that I ended up making that I had tried out before. That normally signals danger to me because I've been known to produce a flop or two on the first stab at a recipe. Now that I've admitted that, I can share my excitement that everything turned out great (except what I renamed pumpkin surprise muffins because when you take a bite, all is well until SURPRISE you bite into a cranberry that bites you back--I'll still eat them, though.). I have a head start on some of the time consuming kitchen tasks for the month, and I have newfound motivation to tackle a couple of other tasks--like dealing with all those sweet potatoes I couldn't resist at $.25-$.29/lb. My freezers are stocked. No, I can't believe I just showed my freezer off to the world, either. It's actually somewhat of an avalanche waiting to happen. 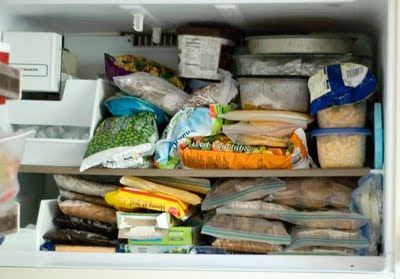 Actually, it did happen a couple of times in the midst of trying to decide what to move to the deep freeze upstairs. But all is well. I am happy...and proud. Can you tell? This seriously is a big deal for me, and I hope it's only the first of many encouraging strides in the development of my homemaking skills. I really needed that right about now. I didn't really mean to throw all that out there, but I guess I always want to keep it real here as we give the world a peek into our home and family. I only pray that our realness...reality...whatever can be an encouragement to someone along the way. I actually just wanted to post a final list of what I accomplished over the past two days and a couple of things I want to accomplish in the coming days. deal with the sweet potatoes - I saw so many yummy sweet potato recipes on Twitter during the cooking days since I'm not the only one who can't resist deals. I definitely want to try to make some sweet potato fries ahead of time since my boys eat those like candy. get to the chicken pot pie - I decided actually to have this for dinner tonight so I can just double or triple it and put some of the filling in the freezer. pizza dough - This is actually pretty easy, and I want to make a triple or quadruple batch soon. It freezes well and makes for a great quick and easy meal as long as you keep the toppings you like on hand. I may actually make some pizza sauce to keep on hand, too. When you consider all of this along with the fact that I still have a whole chicken, turkey, and a half of a ham in my freezer it looks like we're pretty much set for December! Wow...all I have to say is, "you go girl!" I am impressed!